THE BEST ROOTS GROW THE BEST TREES! 5 month old Dunstan Chestnut seedlings grown in 3x3 Tree Bands. Note the fibrous root systems. These pots created air pruning of the root systems and increase fibrous branching compared to growing them bareroot in the field. Bundle of Dunstan Chestnuts prepared for shipping during dormant season. Pots are removed and roots dipped in gel to retain moisture. On the right are roots of grape vines (left) and American persimmon, grown in 3x3 Tree Bands for one season. 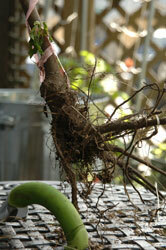 Note highly developed fibrous roots - this greatly enhances transplant success. We only grow trees and plants in root-enhancing containers at our nursery. We use several kinds of pots, depending on the size of the tree, that promote the best fibrous root systems through air-pruning. These special containers grow the trees faster and larger than other methods in the same time frame. 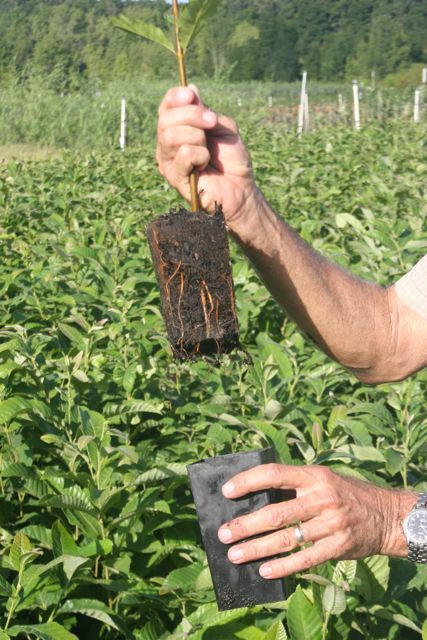 Our trees have much better developed root systems which greatly increases their survival on transplanting, and promotes more vigorous growth in the field. 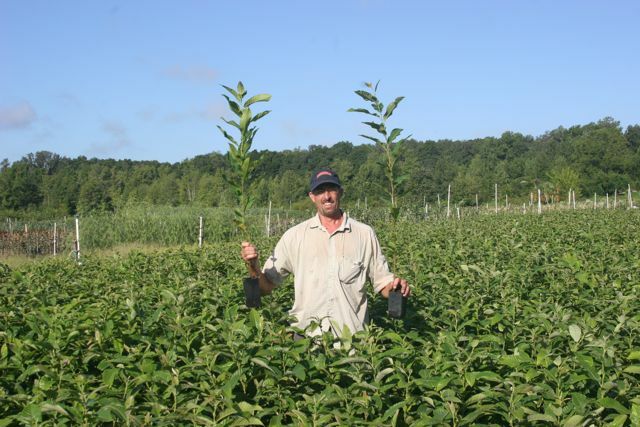 The proof is in the results - you will have better success with these trees than if you purchase smaller, 8-10" seedlings sold by other nurseries. Our trees will often grow out of the top of a 4' grow tube in one season! 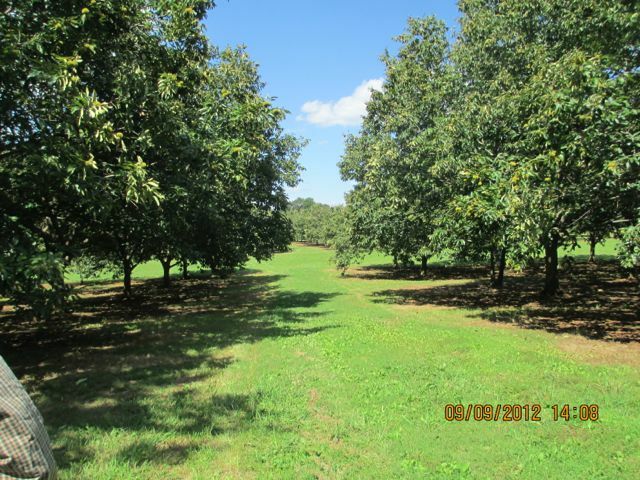 Many mail-order nurseries sell field-grown trees purchased from another nursery and brokered by the mail-order company. Bareroot, field-grown trees do not have well-developed root systems and can dry out and die after digging or during storage before shipment, if not handled carefully. It is cheaper and more profitable for the seller, but inferior for the customer. 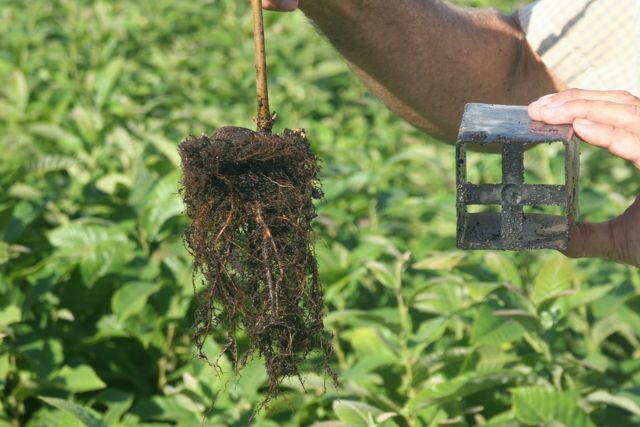 The following picture was actually taken from a major mail-order nursery's advertisement - note the difference in root structure! You get what you pay for. The superior quality and growth of our trees, grown in root-enhancing containers, will insure your success, with more growth of the trees and more production of fruit.